It is pretty common that something that makes you stand out from the crowd might be a problem in the way of bullying or rejection. But, when that thing is a bit of a superpower that can save the day, it is a tad harder to imagine that they might ever have been on the outskirts! Rudolf is great and all, but how about all the other adorable reindeer that just get completely overlooked? We're not talking about the jerks that teased the red-nosed guy. We're talking about the really cute ones that never even got hooked up to the sleigh! It is time to let your cuddly reindeer out to enjoy the limelight. You can do so by giving your pooch this Dog Reindeer Costume and bringing the pupper into the celebration. We can definitely see this bright red holiday harness and the soft-sculpted reindeer horn hood fitting on your pup for the holiday season. Of course, you know what they say about keeping the holiday spirit year 'round! 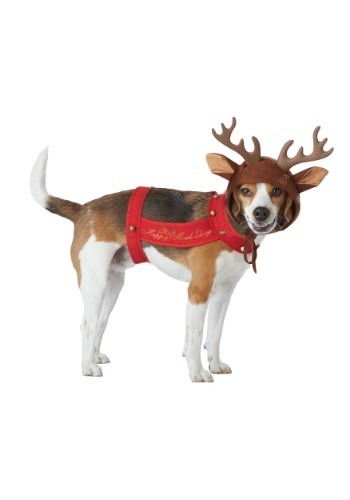 You'll have the most adorable reindeer imaginable whenever you want with this Dog Reindeer Costume. Just remember, though: it is a pretty rare variety of reindeer that actually fly. Most are just great companions! That said, who knows what holiday magic might be around for you and your pup? Don't go by the sizing chart on here, as I measured my dog's chest before ordering, and his chest was 17", which according to chart is a Medium. Got it today and card in package says a Medium is for a 20-24" chest. Won't accept a return because I tried it on my dog to see if it would fit, then took it right off. I'm really sorry this didn't work for your doggo! If you'd like to return it we can certainly accept it back, just reach out to Customer Service with your order number and they will take care of it.